If we go back to the origins of organised bus services around London, the LGOC played a major part by setting up operating agreements with the National and East Surrey bus companies. Strangely, the LGOC provided vehicles and premises in exchange for a fixed proportion of the revenue from the operator. From this arises the assumption that Hitchin Garage was built by the LGOC, as many were, but the truth is much more interesting. A period of litigation commenced on 24th November 1920 between the Hitchin Urban District Council and local residents with a petition protesting about the long standing of buses in the old pig market. The matter continued to fester until the following year, when the fumes and noise prompted further protests. In June 1921, the Council clerk was instructed to tell the culprits to find a proper garage without delay and ‘cease the annoyance’. Vehicles were subsequently stabled at Prime’s Garage in Queen Street, where space was rented in a large shed to the rear of the road-frontage, and later at Deamer’s Yard. Eastern National built their own garage in Fishponds Road between 1937 and 1939, which survived until 2011. That this arrangement was not satisfactory is no suprise, and it is clear that attempts were made to find alternative premises, especially as the motor trade carried on by Prime's was expanding. Another local motor business, R.E.Sanders had a works built in Walsworth Road near to the railway station in 1906, after their takeover of the business of Odell the carriage makers, who were originally in Bridge Street. The Bridge Street premises were very cramped and permission was sought to build a new garage and showroom at the junction of Hitchin Hill and Bridge Street, opposite the 'Triangle', a wide junction with an enclosure of trees at the centre. Ironically, the building on the opposite corner was demolished after being forcibly entered by a skidding bus belonging to Birch Bros.that did not manage the turn into Queen Street from an icy Hitchin Hill. A small business premises, J.Williams & Sons, Iron and Metal Merchants was acquired by Sanders in December 1925, and in February 1928 a planning application was made for a motor garage on the site. We do not know whether Sanders occupied the garage when it was built, but we do know that it was occupied by another coachbuilding company, by the name of Petty, whose name appears in the Hitchin UDC rates book at this time. The firm of Daniel Petty was established in Cheshunt in the early 1900s as a wheelwright, but by 1923 he and his brother Edward were producing charabanc bodies. Business grew by 1929 to one body every second week, but they were attracted to partnership with chassis manufacturer Gilford in High Wycombe and left the business with another brother. By 1930 they appreciated the neglect of their own business which they then concentrated upon, occupying the new garage premises in Bridge Street which was capable of accommodating twelve bodies in progress. There was also a painting and varnishing shed. That was their best year, supplying premium vehicles to large and small operators across England and Scotland. However it was a brief bubble, and liquidation followed by 1933, the market having collapsed as a consequence of the Road Traffic Act of 1930. Some 250 vehicles were produced in total, though none survive today. This period was critical in the establishment of long-distance services into London from the surrounding districts, and the local firm was Baldock Motor Transport (subsequently Queen Line) who operated services to London, Victoria hourly via Hitchin, Stevenage and Hatfield - the Great North Road, and a critical corridor. Faced with regulation of competition on routes, the LGOC acted pre-emptively and started competing services on every London route in the hope that they would be successful in the longer term, even though competitors complained that their coaches were so often almost empty! Their service from Welwyn to London commenced in September 1930, with vehicles based at Welwyn Stores. Subsequent expansion before the cut-off date for services to be registered saw the unsatisfactory base in Welwyn closed, and route R projected from 14th January 1931 to Hitchin with vehicles based at A.E. Prime's Garage in Queen Street. There is a fine picture in the LT Museum collection showing Prime's in 1932. The predatory practices described resulted in the acquistion of Queen Line in April 1933, the route becoming Green Line service AK. On 26th August 1933 a tenancy agreement was made between the newly-formed LPTB and Sanders for the use of the Bridge Street premises at the rate of £225 per year. Another archive picture shows a Green Line AEC T type vehicle under repair inside the Bridge Street garage, apparently in 1936. The tenancy continued until 19th October 1953 when the British Transport Commission purchased the site for £11400. The building was small, however and use was made of open standing at the rear of a building known as the Maltings further up Bridge Street on the opposite side of the road, which fell down completely during demolition. The police were far from happy about the vehicles reversing in against the traffic, but double-deck buses could be stored there, unlike the low garage. Many pictures have been published of vehicles in this yard. The minutes of the London Transport Chief Mechanical Engineer's meeting for 8th April 1953 record under the heading "Building Work" that the company's surveyors had been busy during the earlier part of 1953 at Hitchin, considering the utilisation of the building. The situation was becoming dire because Stevenage was beginning to grow as an industrial centre and more, larger buses were needed urgently. Ken Glazier speculates in his book that the purchase came about because the owners of the building were reluctant to raise the roof. Certainly, the roof was raised after the purchase, as can be seen by comparing original photographs with its 1959 and final condition, although the exact date is not yet clear. The first vehicles to be based here were T class single deckers, exclusively used on the GreenLine service to London. Vehicles for the trunk 303 route were always provided from Hatfield garage. The 329A and 386 routes were always provided from Hertford, and the rare 304 from St.Albans, so the establishment was mostly Green Line. TF class vehicles arrived from 2-9/39, but were taken away for use on London ambulance duities, and the routes suspended. One or two vehicles were allocated to the 384 service from Hertford to Letchworth via Stevenage, and the 364 service to Luton via Breachwood Green. From 1948 the service 383 to Weston was operated in competition with Smiths. Leyland Cubs (C) were used until the advent of the GS in 1953, and Hitchin was one of the first recipients. GS2 (now preserved) was the garage trainer and GS3 appeared in LT publicity fully dressed for the 383 to Walsworth. RF vehicles on the 384 routes were replaced by one-man versions in July 1956. From 1952 the growth of Stevenage New Town began to have a major effect, and increasing numbers of short journeys and Stevenage 'Town Service' routes were operated, for which a fleet of dilapidated STL vehicles, often in red livery, accumulated. Shiny new RF vehicles replaced the TF class, TF77 was withdrawn from Hitchin and is now at the LT Museum. In 1955 the first Stevenage garage was opened from a former BRS parcels depot at Fishers Green, in order to service the new 716A which replaced the 717 to Welwyn Garden City and reduce dead mileage. Initially four RF and two RT vehicles were allocated. The matter of a staff canteen was always a contentious issue, various local premises being leased and used in this way. From the time that the garage was first purchased in 1953 a trailer-based mobile canteen was stationed at Hitchin, until August 1954. Drivers also patronised Bottoms' Cafe on the opposite side of the road by the old Maltings. From now on Stevenage dominated the scene, and in 1958 the new bus station and Town Centre shops opened. Finally, on 29th April 1959 operational use of Hitchin ceased, following removal to the new garage in Stevenage. Several drivers left at this stage due to the difficulty of reaching the new garage from their homes in outlying villages, but local man Percy Hemming was looking forward to the move because the new garage had central heating (Herts Pictorial 10/4/59). He was the only person remaining who had started at the 'new' LPTB garage in 1932, first as a washer, then a mechanic and finally chargehand fitter. A number of local companies occupied the premises subsequently on short-term leases, notably Allender's the Ironmonger and Kodak Limited, who also built a large factory on Stevenage Industrial Area. Finally the site was sold to H.A. Saunders Ltd. on 7th August 1963. They had by this time redeveloped the opposite side of the 'Triangle' into a new car showroom and workshops. They used the old garage for their used car sales area, but from the early seventies the name was changed to Mann Egerton. 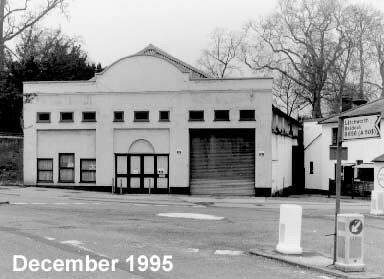 After a spell as a printing works from around 1981, the building was occupied by a number of short-term businesses, most recently as a hand car-wash. The lavish modern premises of H.A. Saunders across the road has fared somewhat badly as well, being occupied by a discount furniture centre, carpet store and fitness centre. Incidentally, the site of Prime's Garage is currently a Netto supermarket. Despite these adversities, Hitchin Garage survived to the 21st century, outliving its upstart neighbour in Stevenage by a long while. By 2012, however, things were taking a serious turn for the worse, with rumours of redevelopment culminating in a planning application for the demolition of the property and rebuilding of flats on the site reaching BUSES and Preserved Bus and Coach magazines. In fact, applications for demolition had been batted around since 1990, culminating in permission for erection of four semi-detached or detached dwellings being granted in July 2013 together with approval for the "Demolition of existing bus station" aka 22 Bridge Street. The job then went ahead very promptly. I must report spirited defence by local people who were aware of the significance of the garage and its position within the town's conservation area. I think that it is a profound irony that the Triangle is returning to residential use after a long while as an industrial or commercial centre. At least Eric Moore's bookshop is still going - I learned recently that the shop was originally the Post Boy public house, in a street that appeared to be all pubs and breweries! Stephen Bradford-Best, Local historian of R.E. Sanders Ltd.